Innovative solutions as unique as your project. To stay competitive and sustain business growth, talent and time are of essence. With project solutions from Experis IT, you’ll benefit from both – with proven methodologies and experienced professionals focused on driving your mission-critical and day-to-day initiatives forward. Applying our expertise in Design Services, Application Development Management and System Implementation, Experis IT offers cost-effective, scalable solutions and flexible delivery models tailored to your specific objectives and organizational style. You get the degree of control you want and the expertise you need to keep your business agile and initiatives on track. 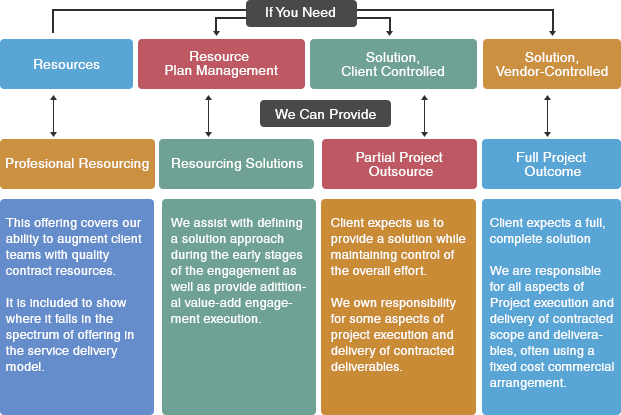 As an extension to this practice we also help in designing tailor made solutions through our Offshore Development Center model, wherein highly qualified IT professionals managed by experienced project managers deliver perfect technology solutions. They seamlessly integrate with the on-site team to cater to the needs of the customers. Their impeccable understanding of the technical requirements and quality orientation drives them to deliver the best solutions on time. Further, This model enables customers to set up their own exclusive teams/facilities in India which are managed / co-managed with Experis IT. While Experis IT can facilitate all infrastructure and HR management, our customer team can focus on the project management and their end deliverables.